What is Content Management System (CMS) and Its Functions? How to Determine Which CMS a Website Has? Definitely, those who ever tried creating a website know the answer to the question “what is CMS?” and even used one of them. Recently, high-quality content acquires special meaning as it helps generate leads and increase readers’ interest. In this article, we will consider what does CMS means and which platforms can be used to create top content. Recently, the concept of CMS is widely used in business and marketing. However, some people are not aware of what is CMS. For this reason, let’s start from CMS definition. 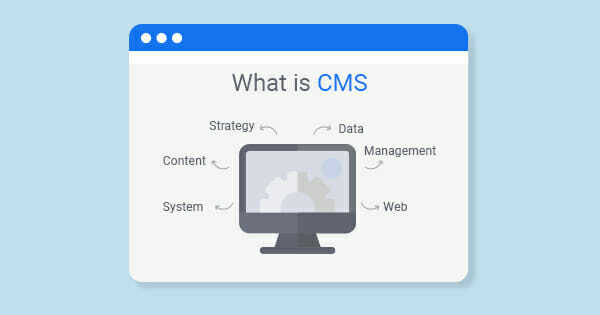 Definition of CMS: CMS stands for “content management system” – this is a software application that aids create, manage or modify digital content. Besides, you can add, edit or delete any published content of your website using this tool. CMS is also used to manage the content of companies’ web pages and websites. Users can store images using CMS, as well as for document and asset management. Professionals also call CMS “drivers”. In the past, the majority of websites were static. If changes in content were needed, site developers had to make these changes manually. Nowadays, there is a need to make changes quickly, and drivers give this opportunity. Sometimes website should be renewed on a continuous basis, but site owners can’t afford this. Drivers help common users who don’t have any professional skills like developing websites or knowledge of programming languages manage content effectively without applying for professional help. Users can make websites and make website changes independently. The main purpose of this system is to collect and combine various sources of information. These sources are available both inside and outside organizations. In addition, this system enables the interaction of workers, projects and working groups with databases that were created earlier. This helps make search process and reuse of data more comfortable. Time costs on developing a website are significantly reduced because a developer doesn’t need to focus on exclusively technical tasks like “how to create a newsfeed” or “how to teach CMS to search goods in a catalog”, but to concentrate on informational and visual component of the future. Even after defining CMS, it’s difficult to imagine for a newbie what is CMS. A good example of CMS is WordPress, but PrestaShop and Joomla are similar drivers. Alternatively, content management systems can extend standard functionality with an easy website builder like MotoCMS. Using CMS systems like WordPress or MotoCMS significantly simplifies content creation and administration. For example, when creating a piece of content without using content management systems, you write an HTML file. This sounds pretty complicated for a common user. WordPress allows creating content by using interface which is more accustomed to users because it looks like a Microsoft Word page. Therefore, creating content with the help of CMS is much easier. A similar approach can be used to upload images or manage media. In this case, you don’t need to directly interact with your server. Although CMS is not a management interface, it allows showing up your content to visitors exactly the way you want. Decomposition of CMS to the components helps better understand CMS meaning. From a technical perspective, it’s divided into two parts: content management application (CMA) and content delivery application (CDA). CMA is used for adding website content and its management. CDA is responsible for hidden processes like storing content and making it visible to website visitors. These two systems help better maintain any website. Here we described the technical side, but what is a CMS website? Front-office – this is a part of the system that provides an interface with users. As we already mentioned above, the main principle of CMS is that website content, and its design is separated. Website design is rarely modernized while content should be changed every day or even hour. Therefore, many CMS use templates. A template is an empty heading of a page with embedded components of website design. Aiming to change content, one should only fill this template with necessary information. CMS doesn’t require the installation of any additional software because it’s located directly on the server. You can access it using your browser. CMS supports various widespread browsers such as Internet Explorer, Mozilla Firefox, Opera, etc. CMS can be used for various purposes. Some of them are designed to solve specific tasks such as running blogs, internet stores or forums. Other systems are universal and offer multiple opportunities to create various projects. Some CMS consist of many functional blocks and modules, others are monolithic and coded. You can use some of them for free; others are paid with the opportunity to edit the core functions of drivers. Simple CMS. This system is used to create simple websites that contain several pages using simple control systems. These systems consist of several modules that are set one time. These CMS are free and are available on the internet. Among their disadvantages are the inability to change settings, low transmission capacity, inability to create pages dynamically and the inability of a delegation of administrator’s credentials to others. Template CMS. It consists of modules as well, but its structure is more complex if compared to simple CMS. Template CMS has high transmission capacity around 50,000 inquiries. Also, it has the support of dynamic pages and the ability to delegate the administrator’s credentials. Many template systems are used to create website content because they are easy to use. Professional CMS. This type of CMS has a higher level of complexity. You may change the structure of internet resources. Additional modules can be attached to these systems. These systems are used to create information portals or massive projects. As a rule, these CMS are paid. Universal CMS. Universal systems have wide functional and ample opportunities in developing websites of any complexity. They support the functions of changing the structure, creating dynamic pages, modification of settings and distribution of credentials. Universal CMS is quite expensive. These CMS are used for work with large portals and web-projects that require high functionality and dynamics. When choosing a website driver, you should evaluate its facilities and functions. Good CMS should be convenient, comprehensive and effective. These content management system examples are listed here to show you that these tools are developed for different purposes, but their many functions are similar. For example, Drupal aids create content and templates both for private blogs and government entities. Magento is a tool for developing content for e-commerce purposes. Joomla is an open, mobile-friendly and free platform. Wix is a product-type website builder. Squarespace is a website helping build blogs and hosting. Different types of CMS serve various customer needs. The market of website content management tools offers other less popular software as well. One can choose a CMS according to his or her requirements and preferences. We included a brief description of the best tools here. Undoubtedly, WordPress is the most popular website content management tool. Even those who don’t directly deal with content management heard this name because the majority of websites are developed with the help of WordPress. This platform was initially developed to create content for blogs. However, many other organizations having brochure-style websites, e-commerce stores and social media websites use WordPress. This platform offers numerous themes and plugins for website content development. These tools are used to improve the functionality of websites. This explains the overwhelming popularity of WordPress among those who would like to develop their own websites. It’s free, and anyone can download it from the web. Besides, multiple tutorials are available on YouTube to learn how to use this powerful tool. Creating website content is easy with its user-friendly dashboard and a wide choice of themes. One can choose templates both for small, medium-sized and large businesses. Joomla also belongs to the top content management tools. Such well-known organizations as Citibank, Harvard University, MTV and IHOP used Joomla to develop content for their websites. It’s also used to create back end networks and exercise inventory control. Tutorials and guiding information is widely available on the internet since Joomla counts multiple users and contributors. However, Joomla can’t boast offering multiple themes in comparison to WordPress. Drupal is used by such large companies as MIT, New York Observer, Fast Company or Sony Music to name a few. It’s often used to build both internal and external websites. In addition, Drupal offers several tools to better organize content. Users of Drupal share their experience of using this tool on forums. Its contributors update tutorials and other guiding documentation on a regular basis. By using these tutorials and instructions, you can easily install this software, build websites and modules. Drupal is ideal for creating content for large companies, but small ones may find a large number of features excessive. The major pitfalls are associated with poor quality and lack of themes. So, you may need to purchase more themes to improve the design of your website using Drupal. Also, its theme system is more complicated if compared to those of WordPress or Joomla. Professionals can identify what platform is this website by checking its history in the browser. One can do it by installing a free Chrome extension. This browser saves all information about the websites visited. In order to get to know which driver was used to create a certain website, you need to analyze website code. Almost all browsers give the opportunity to see page code. Each CMS has specific features by which you can understand what type of CMS was used to create this website. For example, WordPress uses the following meta tags: <meta name=”generator” content=”Wordpress 4.5.3″>. In NetCat, you can identify CMS with the help of catalog/netcat, which contains images. One more way to identify website drivers is to check robots.txt file. In this file, developers hide pages from indexation. It can help reveal all secrets. Commands of each CMS are specific, and you can easily identify them with checker tools. Also, website crawler can detect which cms website uses. To reach this goal, you need to find instructions related to CMS with these commands. Sound pretty simple, yeah? You could use tutorials widely available on the internet if you stuck when developing content. Some hosts help install CMS thus giving you an opportunity to directly start to build your website. Sometimes companies search for fresh ideas on the websites of similar companies. A website of your competitors may serve as a source of new content. So, in this respect, you may wonder how to tell what platform a website is using? Here we will try to answer this question and give you some hints. As we already mentioned here, one way to identify this is to install a browser extension. Except for Chrome extension, you can use a similar tool offered by Wappalazer. Wappalyzer extension is available for Opera, Firefox and Chrome. It displays an icon placed near the address bar that tells you which platform is used by a website. In addition, some extra information is provided in a drop-down menu. Design and editing are two different processes. Even inexperienced users can create, add, edit and format website content without any special knowledge. Use in-built grammar checker to avoid errors. Access is based on roles. Each user of CMS is assigned a specific role (author, editor, contributor, etc.). Some users can be granted with certain rights to change content; others may have universal access. This approach aids maintain access security as it’s restricted according to your preferences. Quick updates. CMS allows updating your website without taking much effort. Free download. Many basic content management system functions are free and can be downloaded from the web. Risks associated with security. Your CMS platform subject to hackers’ attacks. Design can be challenging. It can be difficult to create the website you exactly want using basic functions. Extra funding may be required. Lags happen when assembling all page sections to create a page. Limitations associated with functionality. It’s impossible to handle some processes without rewriting codes. To summarize, CMS is a useful tool for creating website content. Inexperienced users can easily learn how to create websites using this advanced tool. However, using CMS is associated with certain pros and cons, which you may find out from our article.